I can't take those housewives. They are so horrible to each other! And the Kardashians? Someone explain why those people are famous??? I don't get it. I'm a Bachelor fan myself, oh and all the Idol and SYTYCD and stuff like that. Hi!! I'm a new follower from FMBT! Hi-Hi! Thank you so much for following my blog Style Ingenuity! Stopping by and returning the favor! I am a huge fan of the Real Housewives and love to see your take on the show! I'm a huge reality tv junkie. 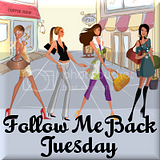 Thanks for following me so I can follow you back! !